La Mettrie’s L’homme machine (Man a Machine or Machine Man) was likely completed in August of 1747. The book was controversial, arguing against the traditional notion of soul and suggesting that man was no different than any other animal. This small volume espousing this materialist philosophy was just over one hundred pages long, written in forceful but casual prose. Less than half a year after its publication, the book became the center of controversy and led to La Mettrie’s self-exile from Holland. The book was printed anonymously and copies were circulating in Holland by December. On December 18th, the publisher—Elie Luzac—was called before the Consistory Church of Leyden and ordered to deliver all copies of the book for burning and to promptly reveal the author. The publisher indeed delivered some copies for burning, but claimed he did not know who had written the piece. The following year, the publisher issued two more printings of the book and then promptly left Holland. University of Akron students take an opportunity to examine La Mettrie’s book at a CHP colloquium on rare books. In the meantime, rumors began to circulate that La Mettrie was the author of the book. La Mettrie was not naïve about the potential outcomes of this: he had previously fled his native France after the public burning of his 1745 book The Natural History of the Soul. He therefore fled Holland to Berlin on February 7, 1748, where he came under the protection of Frederick the Great who provided him with sanctuary and a small pension and made him the official court physician. La Mettrie died of food poisoning in Potsdam in 1751. 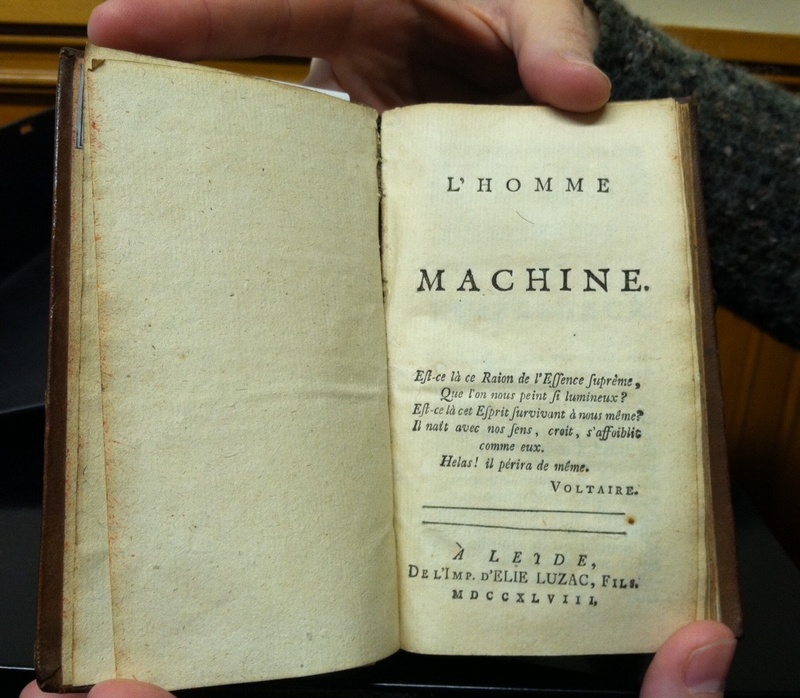 The CHP library hol ds a rare edition of L’homme machine. The title page indicates 1748 as the publication date, but it is believed that this edition was published sometime during or before 1752. 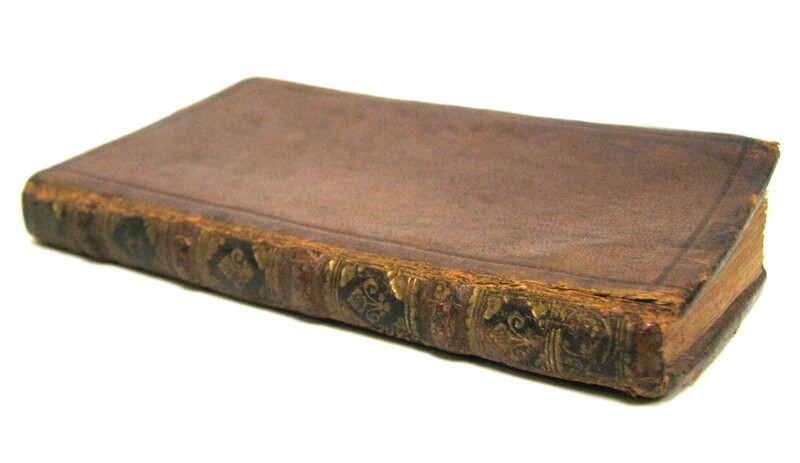 Another edition dated 1748 (but published in 1764) is identical to this one, except that the title page contains a 7-line quotation from Voltaire, while this one carries a 6-line quotation. 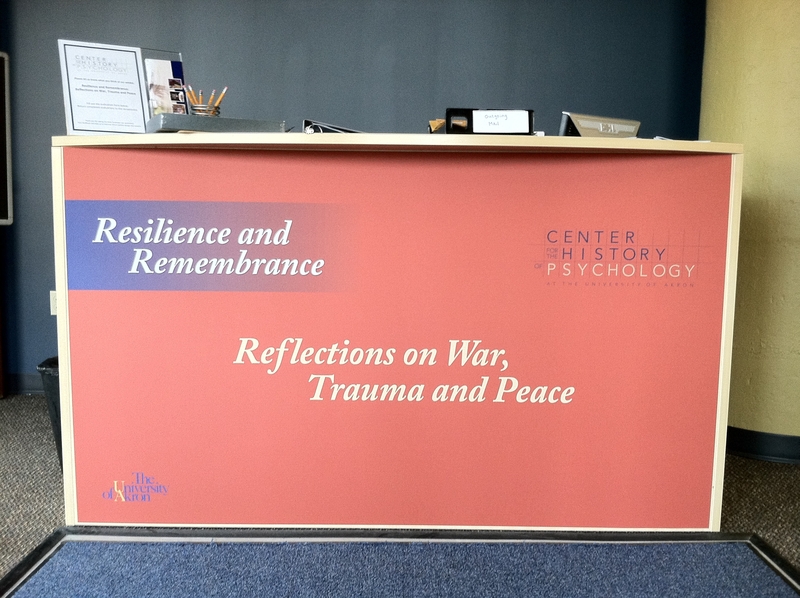 On September 8, 2011, the CHP launched a new exhibit entitled Resilience and Remembrance: Reflections on War, Trauma and Peace. For the first time, we worked with a graduate student trained in exhibit design. Here, Rebecca describes her experience in helping to launch this fabulous exhibit. My name is Rebecca Wehr and I am a Graduate Student in Arts Administration at The University of Akron. I found out about the Center for the History of Psychology through a friend and fellow student who had talked to Dr. David Baker about their affiliation with the Smithsonian. She suggested that I speak with the Special Collections Manager about the possibility of an internship with the Smithsonian. I met with Rhonda Rinehart to inquire about the Smithsonian affiliation. I brought to the CHP a background in museum education, exhibition design and implementation and experience in collections management. This started a dialogue and my relationship with the CHP. It took several meetings to determine what the immediate need was at the CHP and what would make a good reciprocal internship at the Smithsonian. All of the projects sounded amazing to me, but we agreed that I would work on the 9/11 project, which had been “in the making” at the CHP since 2002. I therefore volunteered for the 9/11 project and will later apply to the Smithsonian to complete an internship. During the first several weeks that followed, we laid out a plan for the exhibit and a symposium in early September. The exhibition and symposium commemorated the 10th anniversary of 9/11 and included objects from the CHP archives that touched on the psychology of war, trauma and peace. We started with a working title, acquired objects from “first responders” to 9/11, and a folder of miscellaneous 9/11 personal accounts from 2001. My part of the exhibit was to focus on researching content for the Trauma and 9/11 displays, assist with the design of the exhibition and perform the installation. The process was extraordinary due to the experience of working with a professional team and the display professionals from Bark at the Moon Graphics Studio. Even though I had twenty exhibitions under my belt, this one was by far the most organized and well executed of all. Each week we met, but the real push didn’t come until mid July to early August when we really needed to solidify images, titles, and design aspects for the cases. Our coordinator, Dorothy Gruich, worked tirelessly to ensure all our deadlines were met and that we were all kept up to speed on decisions and progress. As a team, we brought together images, display cases and display props. 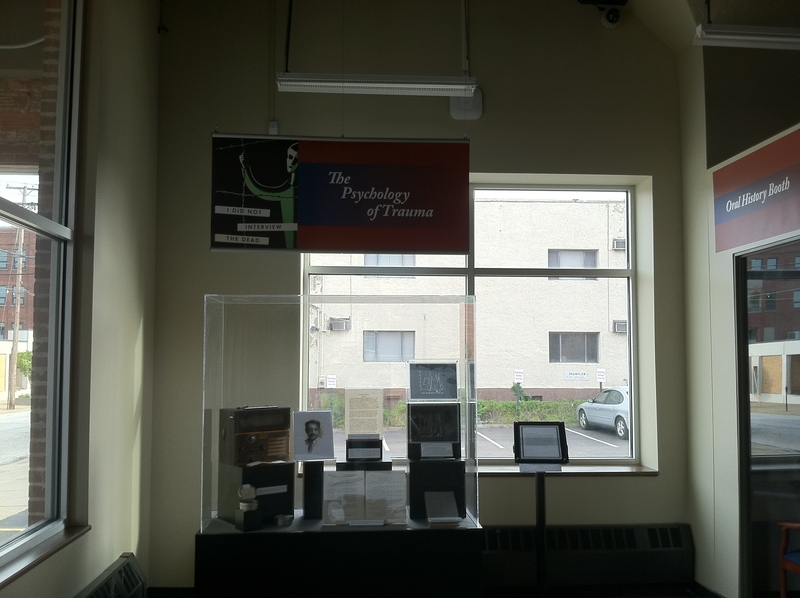 Much of the design for the display cases was done as I researched my topics. So the day before the opening I was prepared with a rough idea of how I wanted to install. The installation went smoothly with a few things needing to be rearranged. I would say that strong team players and vision are keys to great results and this is what we had. 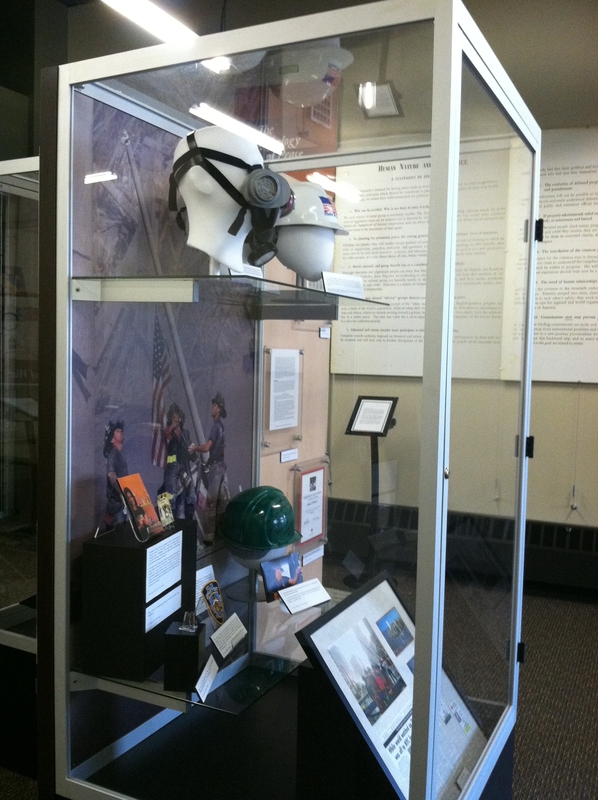 The 9/11 exhibit case features items from ground zero. 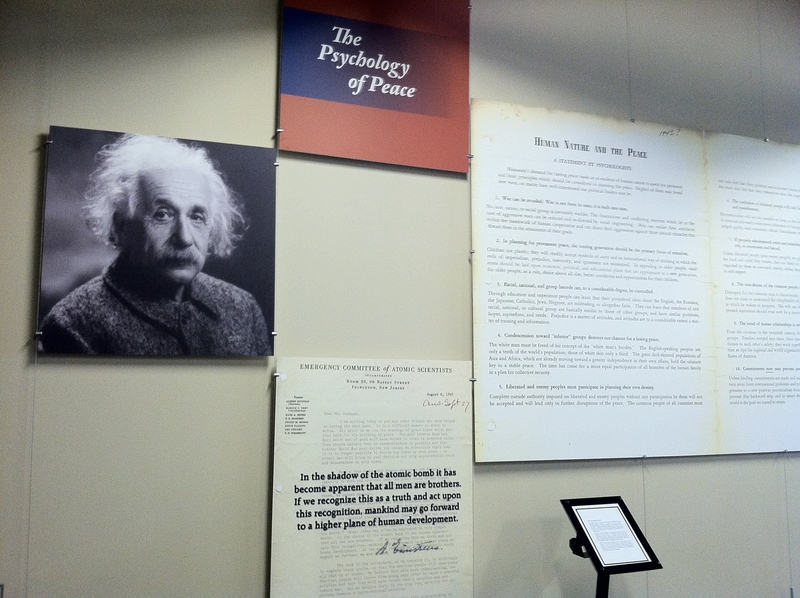 The peace exhibit includes a letter from Albert Einstein to psychologist Henry Goddard on scientists’ involvement in promoting peace. A portion of the exhibit on trauma highlights psychologist David Boder’s interviews with Holocaust survivors. An oral history booth to the right gives patrons a chance to record their own reflections of moments of trauma, disaster, and resilience. I really enjoy the process of planning and researching exhibitions. I also enjoy learning about psychology, so this experience was and is a really good opportunity for me to bring together all those aspects. “Resilience and Remembrance” will be on display until March 31st, 2012. CHP gallery hours are Monday to Friday, 10am to 4pm and Saturdays, noon to 4pm. Admission is free.